Jennifer Saunders began her career in sport at age 10, when she attended a “Learn to Play” racquetball clinic, advertised by the Thompson Citizen. Jennifer went from playing for fun, to joining the junior program. 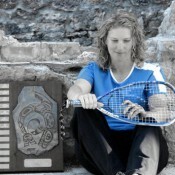 Since then, Jennifer has gone on to win eight National Singles Titles and breaking the record for National Titles by a female, after being down 6-2 and 9-8 in a tie-breaker. She has also brought home five World Championship medals, including two silver medals in 2002 and 2012. Her dream: To meet Wayne Gretzky and become best friends, of course. THOMPSON CITIZEN (July 27) Jennifer Saunders and her partner lost to Aimee Ruiz and Janel Tisinger of the United States in the women’s doubles semifinals at the world racquetball championships in Cali, Colombia to wind up third overall.